Arsenic took my brother’s life. He had developed a wound on his foot from where blood and pus used to ooze out all the time. Despite that, he fought for all of us and tried his best to bring the problem to the government’s notice,” says 60-year-old Radha Mohan Singh, a retired subedar, in Chain Chhapra village of Uttar Pradesh’s Ballia district. 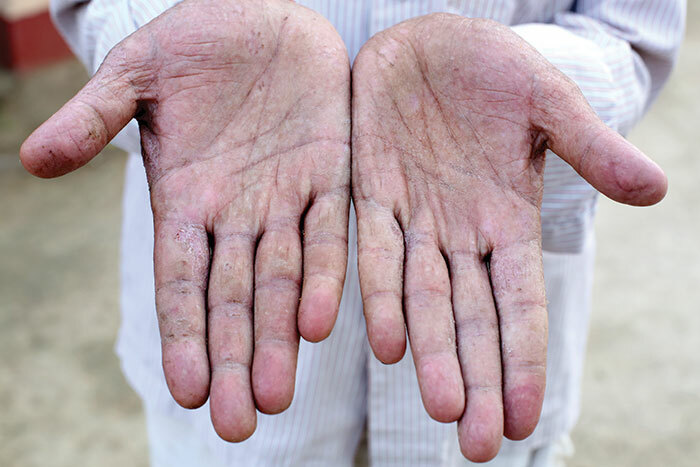 Radha Mohan’s elder brother Dina Nath Singh, a retired army education instructor, had developed black and white marks all over his body and also ulcers on his fingers. He went to Sir Sunderlal Hospital at Banaras Hindu University (BHU) for a check-up, after which doctors amputated his fingers and asked him to go for a blood test. “The test reports confirmed that his blood contained arsenic. The doctors told him that the water in his village might be contaminated. He was worried for the rest of his family. So he decided to approach the Uttar Pradesh government,” says Radha Mohan. 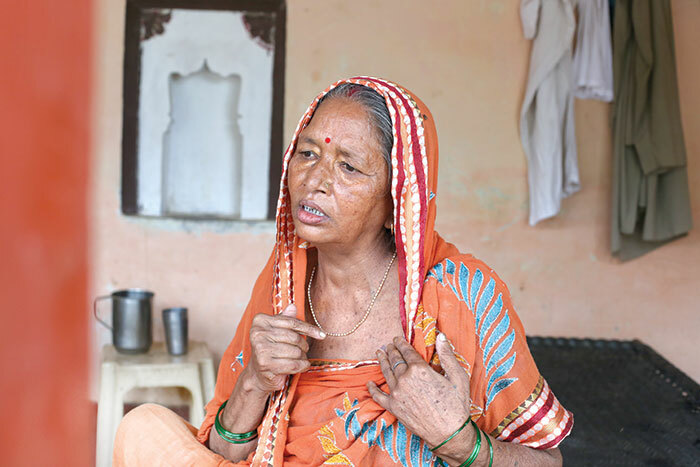 Dina Nath, who was detected with skin cancer in 1996, wrote several applications to the collector and tried his best to warn the sarpanch and villagers about the water quality, but no one paid heed. “No one listened to him at first, but the government took note when he started highlighting cases of people outside his own village who too were developing skin diseases. Around 2004, the government sent a team of researchers,” recalls Radha Mohan. Dina Nath breathed his last in 2010 after fighting a long battle with cancer and the government. Radha Mohan’s family is also suffering from severe health consequences that are the result of arsenic in Ballia’s ground water. His wife Urmila is in a miserable condition as she has a black patch on her chest that itches a lot and she is covered in lesions from head to toe. “These marks develop into boils and I have to go to the BHU hospital to get them removed. I keep itching all day. It never stops. My son can’t digest food properly. It’s all because of the water we use in cooking and bathing,” she says. 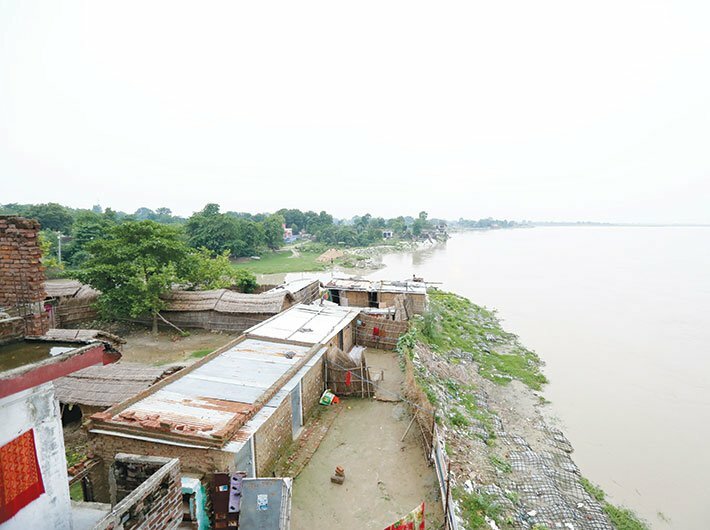 Radha Mohan’s 29-year-old son, Ranvijay Singh, says that nearby villages like Rajpur, Lakhimpur and Gangapur are all facing the effects of this dreadful element. “When you taste the water, you know that it has arsenic. Even when we make tea, it turns black. We can’t swallow food properly. I have lost so much hair and then there are these hideous marks,” says Ranvijay, pointing to the black and white spots on his arm. He adds that the problems caused by arsenic contamination in drinking water are not only medical, but socio-economic as well. “There are many women in this village who have lost their husbands to arsenic poisoning and have no means to support themselves,” he rues. According to Fanindra Rai, executive engineer, Uttar Pradesh Jal Nigam, Ballia, Dina Nath was the first man to draw the government’s attention towards the growing arsenic problem. “Dina Nath had complained to the authorities many times and warned them about the water. He later started giving them proof. Many people in the nearby villages were affected. So he presented their cases before the UP government which led to a research by the Jadavpur University and UP Jal Nigam in 2004-05. We tested the water samples and the results showed the presence of arsenic,” says Rai. He says arsenic was found in the water table of the Gangetic plains and that the villages that were on this belt were all caught in its web. “Ballia’s surface water was always clean. Arsenic is present in the underground water on the Gangetic belt,” Rai says. On its origins, Rai says, “There is no one particular theory. All researches suggest different explanations and all of them are possible. One of the theories says that arsenic flowed in from the Himalaya through the Ganga and got deposited underground in the Gangetic belt.” He also cites another theory which suggests that arsenic was initially in a compound form on the Ganga’s riverbed and started dissolving over the years. This dissolved form got deposited in the Gangetic belt, thus changing the nature of the water. According to UP Jal Nigam data, as of July 1, 2016, as many as 310 villages in Ballia district are affected with the problem of arsenic in groundwater. Rai says that the deadly substance was found in the city as well. “Our earlier research showed that arsenic was not found till the depth of 200 feet of water but now it can be found [right from the top] till 1,000 feet. It’s alarming,” he says. According to the World Health Organisation (WHO) guidelines, arsenic concentration in drinking water cannot be more than 10 ppb (parts per billion). However, Rai says that these standards have not been notified by the government of India. “We take action if water has more than 50 ppb of arsenic. We have seen people using water with 70 ppb of arsenic, yet they are not affected. Generally, it affects [people’s health] when arsenic concentration is 100 ppb or more,” he says. That is ten times the WHO norm. On the initiatives taken by the government to treat arsenicosis in Ballia, Rai says that a permanent solution of providing a water pipeline connection to every household in the rural areas was implemented in 2012-13. “We first tested the soil and water samples in villages and if the results for arsenic presence were negative, we dug tube-wells on the site. Water from these tube-wells flows into large tanks and from tanks into the pipelines. So people who use these tube-wells receive arsenic-free water,” Rai says. In the past four years, around 80 tube-wells have been constructed in six to seven blocks including Bairia, Murli Chhapra, Bilaria, Dubhad and Hanuman Ganj. Rai says that more tube-wells will be constructed in the next few years. “We are working on it. The process is still going on. These things require a lot of effort and there is a lot of paperwork as well, which takes time,” he says. He also talks about another initiative taken after 2008 which was a temporary solution to the arsenic problem. “UP Jal Nigam started setting up ARU (arsenic removal unit) pumps in villages. It is the state government’s initiative. These pumps are attached to the hand pumps and their purpose is to remove arsenic from the groundwater, thus giving clean water to the villagers,” he says. Rai adds that the UP Jal Nigam had identified 310 villages where water showed the presence of arsenic. As of now 365 ARU pumps have been installed across Ballia district. Rai may be gung-ho about the ARU pumps, but Rakesh Kumar, district magistrate [who was later suspended], Ballia, is not satisfied with it. “Mostly, there is only one ARU pump in one village and it is not accessible to the people who live far from its location. It also costs a lot. One ARU pump costs around Rs 2 lakh,” he had said. 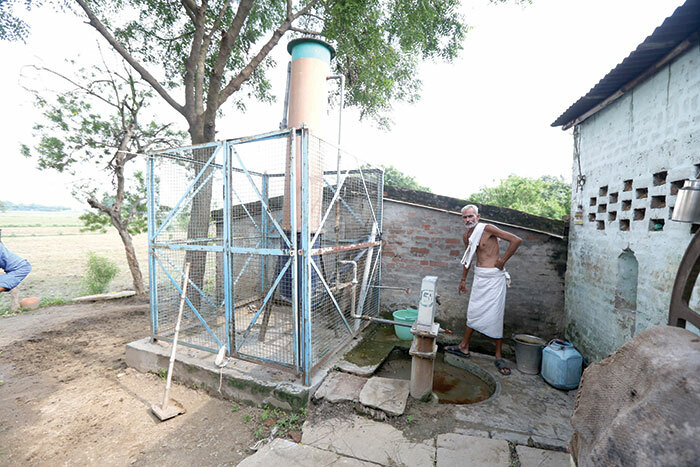 Radha Mohan, whose home has an ARU fitted hand pump, is a tad cautious. “This hand pump is the safest option available because it has an ARU attached to it. However, I cannot say with certainty that the water that comes out of it is 100 percent clean. And this ARU is enough for just two to four families that live nearby. People in this village who live at a distance from us are not able to come here every day. So this water is not accessible to them,” he says. Kumar adds that he had asked the UP Jal Nigam to test the water at his residential and work areas as well. “They found arsenic in one of the hand pumps in the office. I got scared because my office is in the city. I thought I am going to develop lesions all over me. It’s a very serious issue in Ballia. More should be done to tackle this problem,” says Kumar. According to the data provided by the UP Jal Nigam, the villages which have had the maximum presence of arsenic are Bairia, Murli Chhapra, Revati and Dubhad.